All organizations develop a personality. Corporations, companies, non-profit organizations, restaurants, families, bands, card games – groups of people who associate with each other for any length of time eventually organize a framework for their interactions, and that framework derives from the values and ethics of the majority of the people in the group. And the personalities of the people in the group depend on the nature of the activities engaged in by the group that attracted them. Thank you I am proud to be associated with such a "Corporate Culture". Thanks for the thoughtful and eloquent article Rip. I've never been so compelled to reply to a post here, and I'm proud for this one to be my first. As a very recent adopter of the Starting Strength methodology, I'm starting to fight my own fight, and I'm thrilled to be along for the ride. May Starting Strength continue to grow as outlined. I wish you and everyone in 'The Falls' all deserved success, and I will work hard to put myself position to play a small part in the future. Hear, hear. This statement on your commitment to Classical Liberalism makes me proud to be associated with Starting Strength. In a time of increasing political polarization and media frenzy, it can be difficult to stay grounded; in fact, most media outlets would have you believe that there are only two positions available - the Far Left and the Alt Right. Classical Liberalism is the missing third option that people need to hear about right now. Believe in the power of the individual. Believe in nuanced perspectives, views that evolve through open debate and criticism. Believe in liberty - and that means getting government out of our lives. And believe in the spirit of this country: if you work hard enough for long enough, you will be successful. It is incredibly refreshing to read your statement and realize that there are many like-minded individuals out there. I think I speak for many when I say I'm scared of these radical mobs trying to destroy the social fabric of our country. Statements like this bring us back to sanity in such a crazy time. Thank you. A major challenge today is that the far left (including SJWs) doesn't care what you are unless you enthusiastically support their latest push. I would be many in the "alt right" you seem to dislike (gsouflis) have been pushed their by the radicalism on the other side. Most people are "go along, get along" but we live in a society that is allowing less and less of that, to the detriment of all. Time to stop claiming equivalence of all sides and making a stand against those trying to control our thoughts. It is great that this company is under dedicated personal control. That should be a significant help in avoiding the madness of today's leftist crowds. 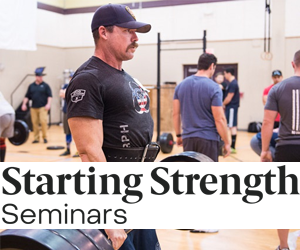 In the push to open up Starting Strength franchise gyms, I hope coaching quality is not sacrificed and that the SSC credential maintains its pedigree. I also hope this endeavor does not diffuse into Crossfit-like entropy. This was really refreshing to read. Amazingly enough, we've already thought about that. In political terms I too am a Classic Liberal though the Left constantly tries to call this position alt right which is in itself an empty title. It is refreshing to learn that the corporate culture is one of reasoned discourse and behavior.